EBOOST brings it again with Joe Fauria. And this time, at Dogpound (@dogpound), one of the most exclusive personal training studios in New York City. What kind of workout does Dogpound have to offer? Focused on personal training with a customized approach and regimen that includes fitness and body metric assessments for benchmarking, and nutritional programs for guidance, Dogpound is known as one of the hottest studios in NYC. Dogpound’s clientele is an elite group of athletes, celebrities, Victoria’s Secret Models, Wall Street business and fashion biz professionals. All sessions are personalized. And so it was. Joe’s workout was strenuous, sweaty, and awesome. He performed resistance training, lifted weights, and at one point, even had chains connected to his bench press, in order to work with his natural strength curve and increase resistance to maximize his workout. FACT: Dogpound is dog-friendly and that’s how they came up with the name. Joe goes into beast mode with after drinking EBOOST Vanilla Prime and absolutely kills it, of course! After the intense workout, Big Joe asks to be critiqued on his performance. “For such a big guy, you move great,” says Reinhard Nee. Stay tuned for next week’s video episode release for Joe vs. Gym – next Thursday, November 16, 2017. Joe vs. Gym is a Web Series powered by EBOOST launched in November 2017. Joe Fauria, former NFL titan and powerhouse stars in this upbeat workout series, as he takes on some of the most challenging gyms in New York City. To check out last week’s episode, click here. 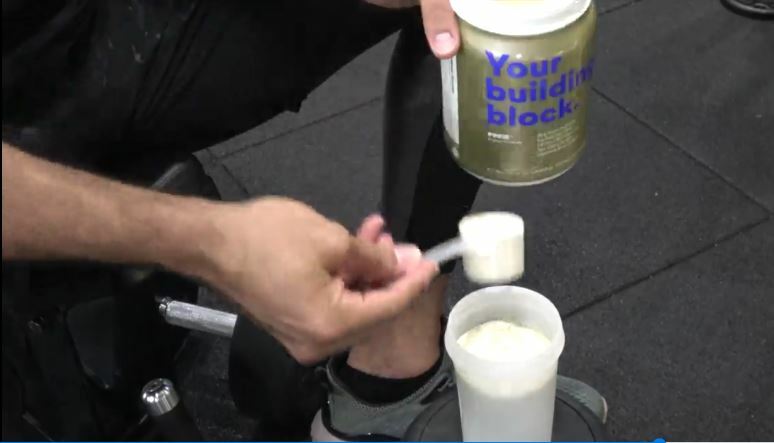 Joe chooses EBOOST PRIME – Vanilla flavor as his “building block” choice of protein during this workout. EBOOST’s PRIME is a highly purified grass-fed whey protein for strength and replenishing. The uniqueness of EBOOST’s protein formula is that it’s natural, formulated with probiotics and enzymes, and that it tastes amazing. PRIME comes in chocolate as well, and it’s sold in packet and tub form.